Have you been battling with a lot of those miss hit golf shots that are really frustrating either off the heel or off the toe? Maybe even battled with some of those fat or thin golf shots. Well, I got some fantastic news for you today. I going to walk you through over the next four weeks a step by step process that's going to help you get into a tour quality impact position every single time. Your goal in this video series is not only to become a really fantastic ball striker, but it's to also have a good clear understanding of what your problems may have been all along. That's right, so I'm going to actually lay out a detailed list of check points. It's going to give you a good clear understanding of what you may have been doing wrong, and what you're going to look to do to correct it. If you look at golf as a whole from at a professional standpoint when you watch all these guys on TV, and we see all these different strokes. Different strokes for different folks, right. There's two really common things that are shared amongst all those players. That's the position of the lead wrist at impact, and the maintaining of the angle to the spine through the hitting area. Those two areas are going to be addressed. I'm going to lay out some drills. I'm going to lay out some repetitions that you're going to be doing throughout each week, and at the end of this video series, I'm going to teach you how to ramp your speed up so that you have tons of compression, tons of lag, and tons of speed just like you've always wanted. Okay gang. Time to get excited. Here we are at week number one to correcting your ball striking once and for all. Our goal this week is to be focusing on the position of your lead wrist at impact. I know I said during the opener what's one of the common things that we see amongst tour players is that they have that flat or slightly bowed lead wrist. Where amateur golfers tend to have a cupped or scoopy wrist position through the impact area. Now this can add loft to the club. This can make the club come is a little bit scoopy and make it very difficult for you to compress the golf ball properly. What our focus point between now and next week's video, aside from the left wrist is that we're going to hit a repetition range here of 1,000 reps. I know it sounds like a ton, and everybody at home is panicking. How am I going to get 1,000 reps done? Well, I'm going to break mine up over five days, and this doesn't need to be done out on the golf course or on the driving range. This can be done right from the comforts of your own home, right in front of your garage, even in the kitchen if you feel like that's a good place for you to do it. What we're going to be focusing on is isolating the other moving parts of the body. Again, we're starting out very slow. We're going to put our training wheels on because we have to focus on the position of the lead wrist and the lead wrist alone. What I want you to do over the next week and for our thousand reps, and I'm going to go for 200 today. So I'm going to go ahead and take my normal set up here, and I'm going to shift my weight over to my lead side by rolling to the inside part of my right foot. So you see how most of my weight is now getting over to my lead side. Now, what I want you to do when you're starting to shift this direction is I want you to try to keep your head still. This is going to promote a little bit of what we call secondary axis tilt. You need that in a golf swing. That helps shallow out the swing plane. Go ahead. I'm going to show you here from a starting point. I'm going to shift, but I'm going to try to keep my head back behind the golf club. Now, what I want to do when I grip the golf club here is I want to focus on the back three fingers of my left hand. No tension with the thumb, and no tension with the pointer finger. I'm going to focus on these back three fingers. That's where a little bit of my pressure's going to be. Not tons of it. Just like if you were holding that tube of toothpaste that we've talked about in the fix your release video. So I've got my pressure back there, and what I'm going to do with my right hand because this is typically the culprit for causing this scoopy like position, is I am just going to open my palm here. I'm going to slowly put my fingers around the club, not to the point where there's any sorts of pressure. It's just going to rest there. What we're going to do is rather than having any sort of weight shift or big rotation is we're just going to swing our arms out to nine o'clock. Again you can see my right hand is just very relaxed on the club. Any of the pressure that I feel is in these back three fingers. We're going to swing back to nine. No pressure on that right hand, and we're just going to go ahead and swing through, focusing on the lead wrist rotating. The right hand should feel like a back seat passenger here. It should just feel like it's just hanging on. You're going to focus on the lead wrist just rotating. Your check points here when you get out to nine o'clock, lead wrist should be pointed out in front of you here. You can see that if I had glove on or my watch is pointed out in front of me. My right hand is very relaxed. My grip pressure is back here in these three fingers. I'm just going to focus on the lead wrist just falling and rotating, so now when I get over to this check point, my glove logo is going to face behind me, not up in the sky. Not down at the ground. Again, make sure that you're not pushing the club through with the right hand. You want the right hand to feel like it's a back seat passenger. You're going to just rest your fingers on the outside of it. The way this looks, okay my weight's on my lead side. Swing my arms out to nine, and then I'm going to let my arm just swing through and release. You can hear how crisp that sound was. If you still struggle, and you're noticing that your club head is really starting to look flippy at impact, then get the right hand completely off there, and just focus on your left arm for the next week. Promise you that'll help you drastically. Okay, so this is our game plan. I know it seems a little small, but I got to remember we got to start small first. When I start to stack in these next pieces over the next three weeks, you'll see that all this will come together. We'll have a good impact position with a lot more speed. So, get to work. I'll see you guys next week. Let's make it a great day. 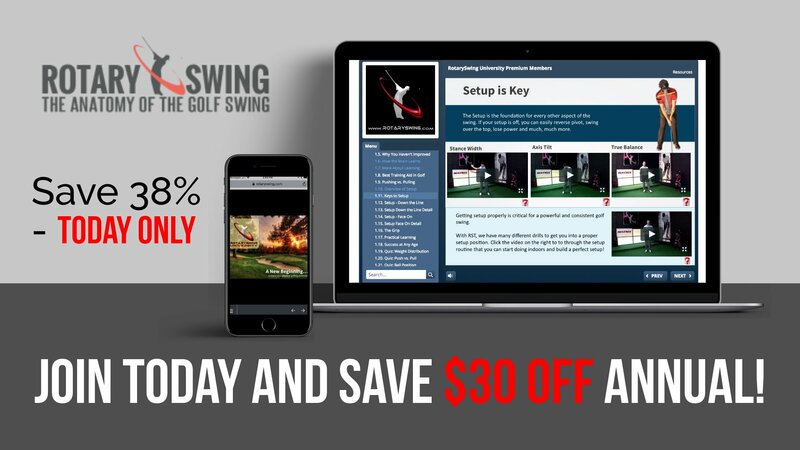 Get Your Free Membership to Finish Watching "Perfect your golf impact - 1 of 4" Right Now!